If you read this blog regularly, you have probably noticed the lack of posts the last couple of months. This is due to a very busy season spent preparing to sell our home and the subsequent packing upon obtaining that goal. This process began last fall with lots of interior painting, caulking, etc. and culminated in a flurry of selling things on craigslist and packing things for storage. As of today, we are officially homeless! Yay! Well, not really homeless. With the exception of a few bins in my family's attic, we have downsized our stuff to a 10X20 storage unit, and put the "necessities" of life in our 30ft travel trailer where we will be living until we decide otherwise. This has been a challenging, yet liberating experience for all of us. Having a much smaller "house" will force us into a simpler lifestyle for a while which I welcome. One challenge will be keeping the kids' stuff (mostly toys) to a manageable level as we have limited living and storage space in the RV. The kids love to spend a weekly allowance on toys and mommy is guilty of grabbing that great deal off the Target clearance rack. Therefore we will all be focusing on investing in experiences and not stuff during this season. 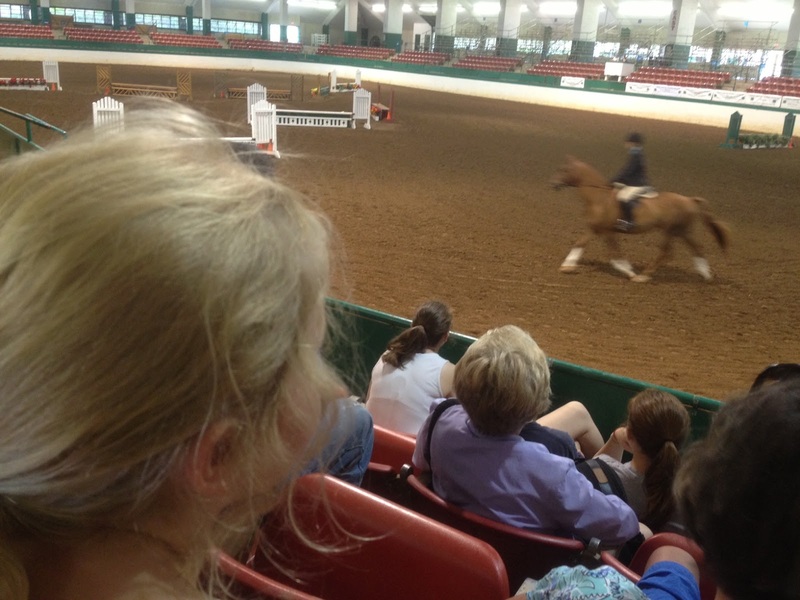 Today, we walked to the horse complex (a perk of camping at the fairgrounds) to check out the 4-H horse show. Instead of buying a stuffed horse from the vendor (per Elisabeth's desire), we got a funnel cake and fresh squeezed lemonade to share while we watched the exhibition. so happy for you! we had a thank you note to hand deliver to you too that never made it, sorry! it's sitting here still. Hey Shannamama! I suggest for each new toy, one old toy must be given away to a less fortunate child. It may help you. Thanks Bettie Lou. Good approach Mark. I have been using that one with some success. Bless you guys!